Two years ago the European Commission announced plans to modernize EU copyright law. Initially, the idea didn’t receive a lot of press, but in recent months the attention has been massive. Article 13, in particular, has been controversial. The latest version, adopted by the European Commission in September, could make large Internet services liable for infringing content uploaded to their platforms. The music industry has widely supported this proposal, hoping that it will help them to negotiate better licensing deals. YouTube, in particular, is seen as the main target, according to the major music companies. Interestingly, YouTube initially remained mostly on the sidelines. The company only got publicly involved fairly recently, but is now ramping up the pressure. Following comments from YouTube CEO Susan Wojcicki, who warned that Article 13 may force YouTube to block videos for EU visitors, this week the platform launched a pop-up campaign to inform the public. As noted by The Verge, several European YouTube users spotted a popup stating that “article 13 could have unintended consequences,” pointing them to the company’s “saveyourinternet” campaign page. YouTube notes that creators and users will be directly impacted if the current version of Article 13 passes, but adds that there’s a “better way.” While this message isn’t new, it’s the first time that YouTube has actively mobilized its users with pop-ups. It’s worth noting that YouTube is not against the intended goal of Article 13. In fact, it even believes that upload filters (such as its own Content-ID) can be part of it. However, platforms should only be held liable if copyright holders help platforms to identify infringing content. This is a compromise and one that not all opponents of Article 13 agree with. 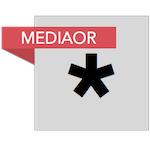 Just last week, Pirate Party MEP Julia Reda said that YouTube’s pro-filter stance is no surprise, as this may actually benefit the company. “If the entire market was obliged to install such filters, YouTube would not only be miles ahead in of its competitors in the development of such technologies, it would also be in a position to sell its filters to smaller platforms,” Reda said. YouTube, meanwhile, doubled down this week. In an op-ed for MBW Lyor Cohen, Global Head of Music, warned that tomorrow’s generation of European artists is at stake. “Rather than drive more value to artists, major labels and small, independent artists would get less money and less promotion from open platforms like YouTube,” Cohen wrote. These comments didn’t sit well with the UK music group BPI. In a reply, Chief Executive Geoff Taylor notes that he is happy that YouTube also believes that artists and labels should be paid fairly, but it doesn’t agree with its tactics. “[T]his is difficult to square with its ongoing carpet-bombing propaganda against that provision, which feels like a challenge to the legitimacy of the democratic process,” Taylor says. Various stakeholders are currently discussing the final wording of Article 13 which will be voted on early next year. According to the first signs, the latest draft still calls for upload filters, albeit indirectly. It is expected that both supporters and opponents of the plans will continue to raise their voices during the weeks to come. One side is calling to support artists’ livelihoods, and the other is urging the EU not to ban memes. 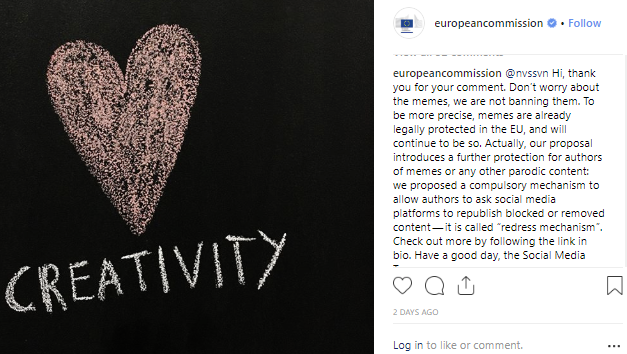 Considering the latter, the European Commission’s social media team came out with a reassuring message on Instagram this week. “Don’t worry about the memes, we are not banning them. To be more precise, memes are already legally protected in the EU, and will continue to be so,” it wrote.